Located at 1472 N. Highway 17, the hotel is minutes from downtown Charleston, the region&apos;s historical and cultural epicenter. Cambria Hotels has made its official entrance into the Charleston, S.C., market with the debut of the Cambria Hotel Mount Pleasant – Charleston. The 112-room hotel exudes southern charm and provides travelers looking for an authentic experience with a sense of connection to coastal South Carolina. The Cambria Hotel Mount Pleasant - Charleston marks the brand's first hotel opening in the state, with seven additional Cambria hotels under development in cities such as Greenville, Spartanburg, and Fort Mill. Located at 1472 N. Highway 17, the hotel is minutes from downtown Charleston, the region's historical and cultural epicenter. The renowned City Market, the Dock Street Theatre, the College of Charleston, and an eclectic bar and restaurant scene provide guests with plenty of local attractions to enjoy during their stay. The sprawling beaches of Sullivan's Island and its quaint Middle Street downtown area are also easily accessible from the Cambria Hotel Mount Pleasant – Charleston. "From the seemingly endless beaches to the culinary experiences and boutique shops on King Street, the Charleston region's vibrant culture has long attracted guests from near and far," said Janis Cannon, senior vice president, upscale brands at Choice Hotels. "We are committed to sharing authentic, local flavors with experience-hungry travelers while providing modern amenities and little luxuries to help them make the most of their stay." The Cambria Hotel Mount Pleasant – Charleston was co-developed by SpringBridge Development, LLC, and Mount Pleasant-based Landmark Enterprises. 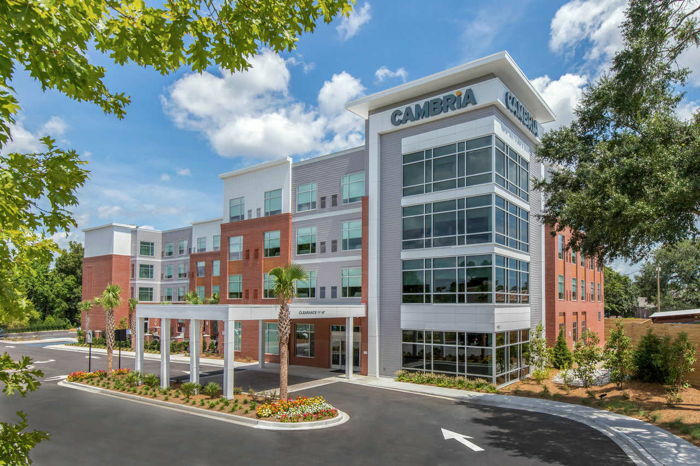 "Choice Hotels has been an invaluable collaborator as we've grown our upscale portfolio, which will include hotels in Greenville and Summerville, in addition to the Cambria Hotel Mount Pleasant – Charleston," said Grey Raines, managing partner, SpringBridge Development. "The Charleston region is flourishing in both tourism and business as more people discover its charm and an economic landscape poised for sustained growth." As a part of the hotel's grand opening celebration yesterday evening, local students from Wando High School's culinary program were presented with a $2,500 check from the Cambria Hotel Mount Pleasant – Charleston and Raines Hospitality to support the program, including supplies and assistance for traveling to competitions. The student-chefs also provided desserts for the evening's festivities. "As a local business, we take tremendous pride in fostering advancement in our community," said Jason Ward, president, Landmark Enterprises. "The Cambria Hotel Mount Pleasant – Charleston brings to life all of the reasons we love calling this region our home, and we are eager to bring guests a glimpse and a taste of the beauty coastal South Carolina has to offer."